A nuclear power plant in geologically unstable, fire-prone Corral Canyon? What could possibly go wrong? 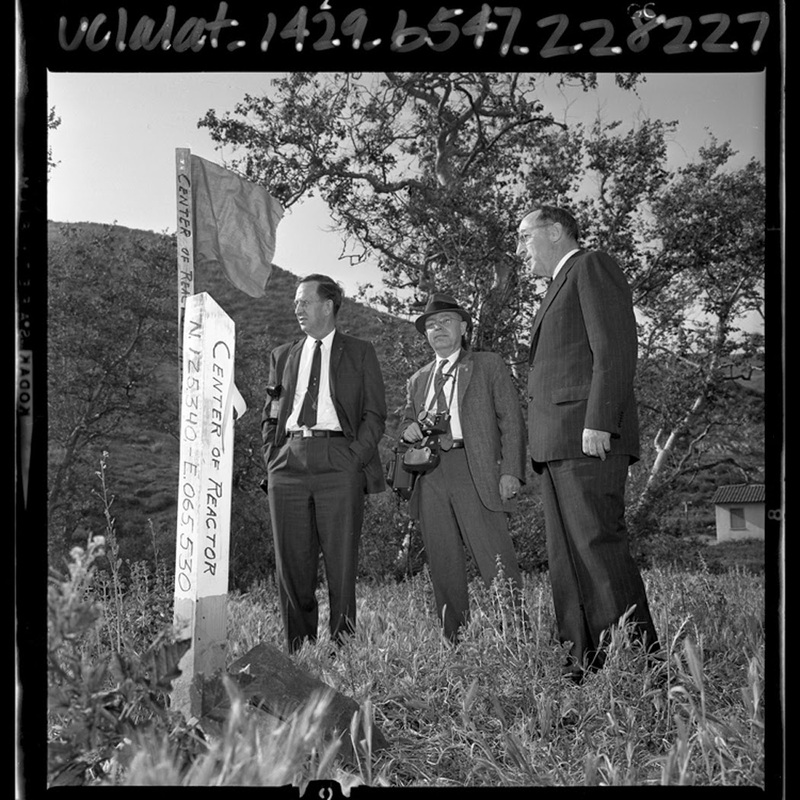 The caption for this 1965 Los Angeles Times photo reads: "Three members of the Atomic Energy Commission inspecting the site of proposed nuclear power plant in Malibu." I wish I could say the image is an April Fools joke, but it's not, it's taken unaltered from the UCLA Library Digital Collections. There's a certain kind of person who can't see a mountain or a canyon without wanting to flatten it or fill it and build Hilltop Luxury Homes or Canyon View County Clubs. Perhaps the thought of undeveloped land fills them with a sort of horror vacui. It certainly seems to kindle an overwhelming lust for profit in some people. But then there's another kind of project, the civil engineering programs that are vast in scale and have the power to entirely rearrange the landscape, rarely to the benefit of the environment. Anyone who has lived in Malibu—or anywhere in California—for any length of time knows about both kinds of scourge. 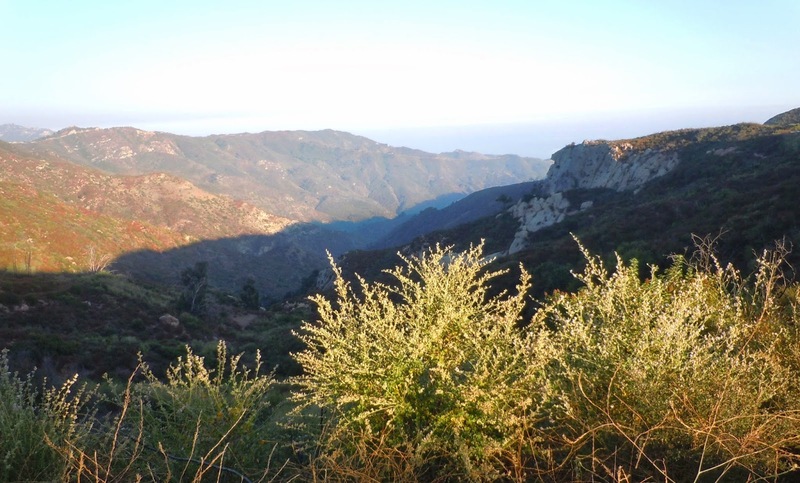 We're fortunate, because Malibu has also had passionate defenders willing to fight to preserve at least some of what makes this place special. 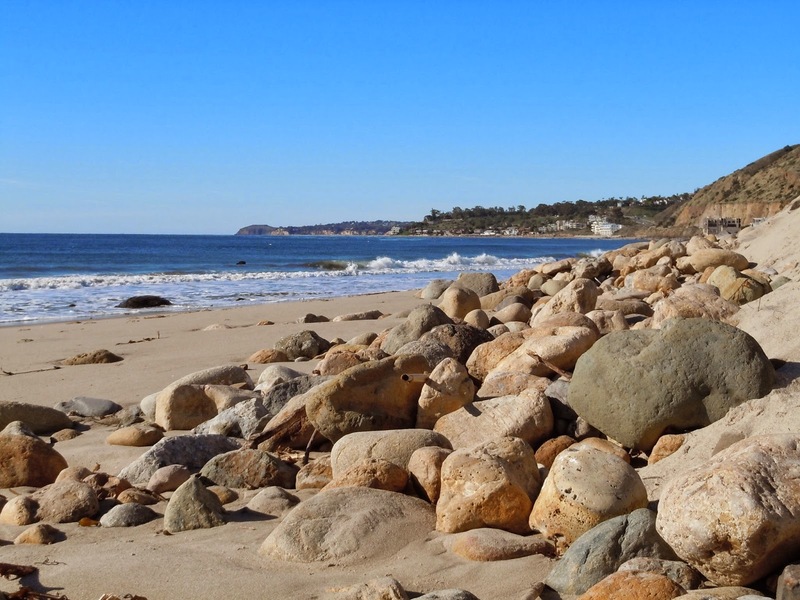 Many of the biggest—and craziest—Malibu terraforming development projects of the 20th century never happened, thanks in part to community opposition. From a 21st century perspective, most of those plans look completely lunatic, but somebody thought they were a good idea at the time. In honor of the Feast of Fools, we'll take a look at some of the more outré proposals. Los Angeles County's nuclear power plant plant is part of local legend. In 1963, the Department of Water and Power proposed a San Onofre-type nuclear power plant on 305 acres at the heart of the Corral Canyon. Media reports from the time describe it as "the largest atomic plant ever [to be] built," and detail plans to pump seawater under Pacific Coast Highway to cool the reactors, and back out to sea half a mile offshore. Unsurprisingly, the plan touched off a chain-reaction of opposition. In 1970, after a losing a savage fight with environmental activists and residents, and after a number of doom-filled geologic reports that warned of potential landslides and earthquake faults, the DWP quietly dropped the plan. Concrete foundations at the site reportedly belonged to an early, failed attempt to build a facility to breed and slaughter foxes for the fur trade, and have nothing to do with the DWP's nuclear experiment, despite persistent rumors. Today, the photo shown at the start of the post is just about the only visual evidence, but the DWP plan left a lasting legacy in that it was a wake-up call. 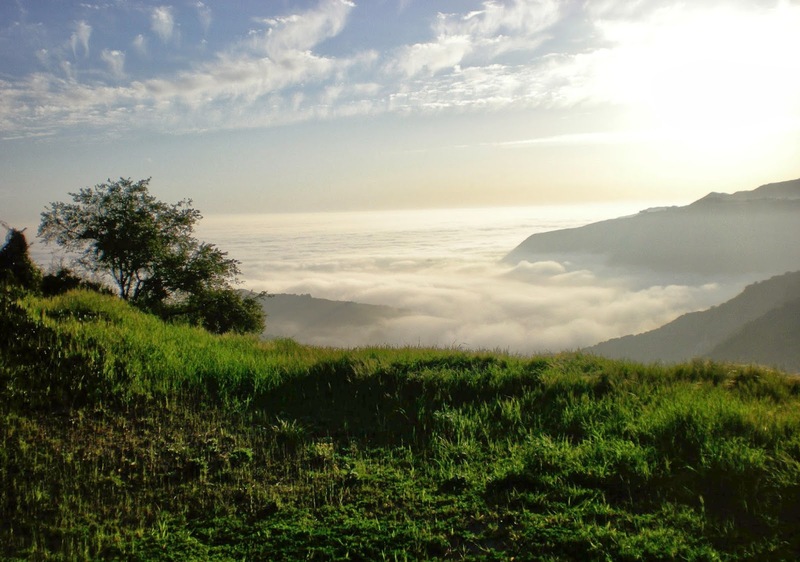 A number of the activists who united to fight the nuclear plant would continue the battle to preserve the Santa Monica Mountains as a National Park. A Los Angeles Times article from December 9, 1990, states: "[Opponents] are especially upset by plans to move 5 million cubic yards of dirt on the property and fill in an entire canyon...But developer Sidney McClue Jr. of La Jolla-based Sun Pacific Properties last week told the supervisors at a public hearing that 'state-of-the-art' procedures would ensure that construction did not damage the ecologically delicate area." That was suppose to make it all magically OK.
"'Our desire was the best possible development, McClue said. 'Our concern was to address every issue. . . . We are not establishing any new procedures or cause for concern.'" Developers often seem to have a lot a faith in imaginary engineering. The City of Malibu's current sewer plan for the Malibu Civic Center comes to mind. It also appears to operate on magical state-of-the-art technology that, like the action in superhero movies, isn't affected by the laws of physics. The Santa Monica Causeway, another mad plan from the 1960s was another project that seemed oblivious to the laws of physics and the natural world. According to a 2008 Santa Monica City Landmark Report, "In May 1958, The Los Angeles Times reported on a bold proposal that Mr. John Drescher was preparing for the California Highway Commission. Mr. Drescher, a local engineer, had developed a plan to construct a causeway off the coast of Santa Monica and Pacific Palisades in order to relieve coastal traffic pressures. Mr. Drescher argued that his proposal, at an estimated cost of approximately $15 million, was more economical than purchasing land to expand the existing coastal highway. In addition, an offshore causeway would increase beachfront property values, serve as a breakwater for new harbor development, and create a beachfront on the causeway’s ocean side." The Santa Monica Causeway, first proposed in 1958, would have stretched from Santa Monica to Malibu on a series of islands made out of 100 million tons of rock and fill blasted out of the Santa Monica Mountains. The causeway, including a 200-foot-wide freeway named the "Sunset Seaway," would have stretched from Santa Monica to Malibu along a series of manmade islands more than half a mile out to sea. Paula A. Scott, in her book Santa Monica: A History on the Edge, writes that the Army Corps of Engineers "declared the project 'technically feasible,'" in 1963. The same year the DWP came up with the Corral Canyon reactor plan. Just what the Corps thought was "feasible" about Drescher's plan to blast large sections of the Santa Monica Mountains into rubble and ferry almost 100 million tons of stone and fill out to sea on a conveyor belt is hard to comprehend today. Everyone involved in the project seems to have been able to believe "six impossible things before breakfast," just like Lewis Carroll's White King. Scott quotes Robert E. McClure, the man immortalized by the McClure tunnel, who reportedly described the project as "attractive and inoffensive." Mark McCuigan researched and wrote a fascinating and in-depth account of the project for the Lookout News in 2003. It's available here. He writes, "For years the audacious scheme to create a chain of islands linked by a causeway lay dormant, hidden in a cardboard box in the vaults of City Hall. Before fading from memory, the ghost of this white elephant continued to stalk City Hall until the '70s, when a scale model of the project, sitting in the planning office, mysteriously disappeared." 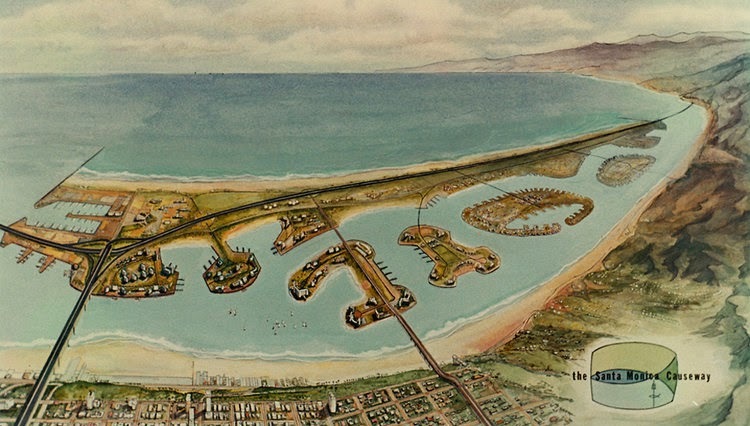 The Causeway wasn't the first attempt to turn the Santa Monica Bay into a major harbor. Southern Pacific Railroad reportedly pressed for a seaport in Santa Monica Bay when the railroad arrived in Los Angeles. In 1893, the 4700-foot Long Wharf, billed as the "longest pier in the world," was constructed just north of Santa Monica. Freight trains traveled from downtown L.A. out to the end of the nearly mile-long pier to pick up cargo, but plans for a full-scale commercial harbor evaporated in 1897, when Congress chose San Pedro Bay to be the official deepwater port of Los Angeles. All that's left of the Port of Los Angeles Long Wharf is a sign near Temescal Canyon naming the site California historic landmark # 881 and some broken pylons that are a popular destination for divers. 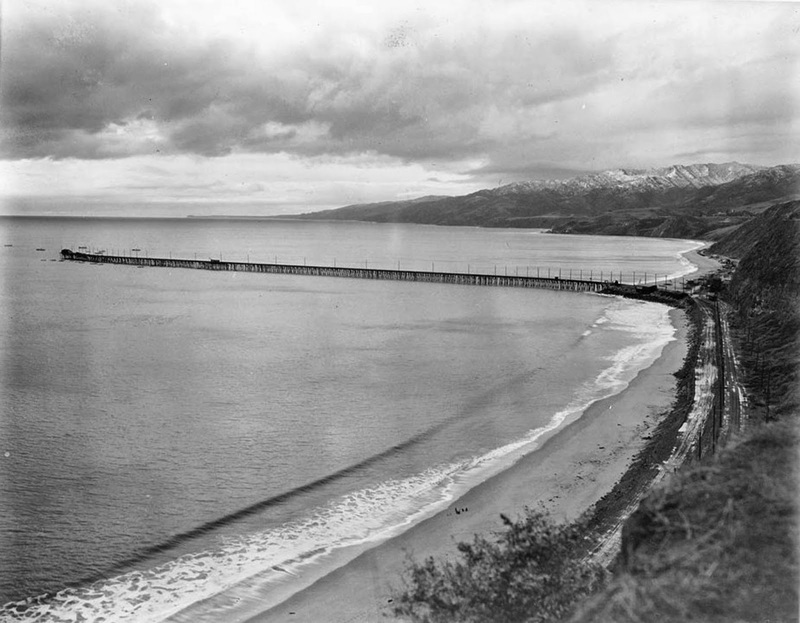 The Long Wharf, also known as the Southern Pacific Mammoth Wharf and the Santa Monica Long Wharf (it was really in what is now Pacific Palisades), in 1916. That's Point Dume in the distance. WaterandPower.org has an incredible collection of Long Wharf photos online. 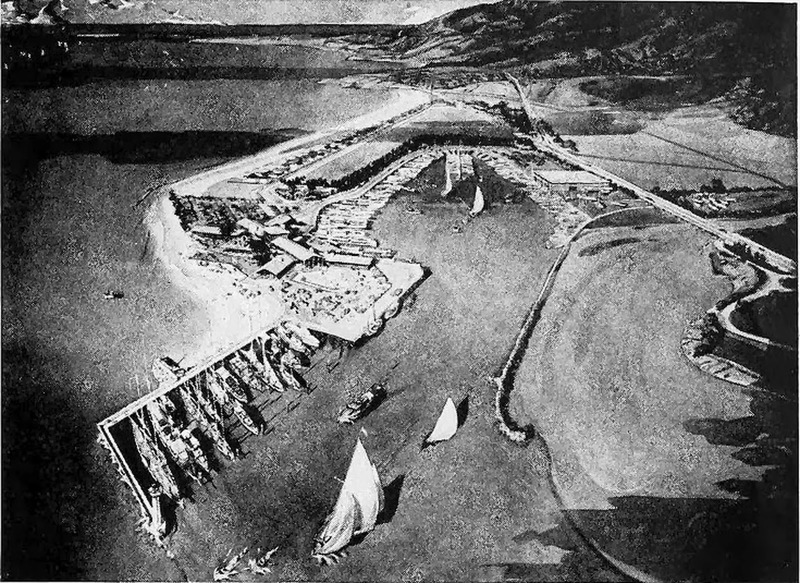 Closer to home, a developer named Edward B. Turner hatched a plan in 1946 to transform the Malibu Lagoon into a yacht harbor with berths for 500 yachts, a two-story concrete boat garage capable of storing 180 additional vessels, and a 60,000-square-foot clubhouse. the plan also called for 11 acres of dredging and a 4700-foot breakwater, which would have rendered the argument between State Parks and local surfers and conservation activists over lagoon restoration moot, since there would have been neither surf nor lagoon if the project had been constructed. State Parks' Malibu Lagoon Restoration's concrete and steel "amenities" are still a sore point for many Malibuites, but developer Edward Turner's 1946 plan to transform the lagoon into the Malibu Quarterdeck Club and Yacht Harbor—a smaller version of Marina Del Rey— would have radically altered the entire ecology of the area and eliminated the surf break at Surfrider. Here's an artist's rendering of the marina. The overly optimistic Turner built a vast shed to house the heavy equipment he would need for the project and reportedly began work before receiving final approval. He met ferocious opposition. Project opponents included Rhoda Adamson, the daughter of Frederick Hastings Rindge and May Knight Rindge, and William Huber, who owned the Malibu Pier in the 1940s. The fight continued for over a year. Turner won and began excavating the foundation for the clubhouse in September of 1947. He held a BBQ in the Malibu Colony in November, to celebrate the start of construction. Two weeks later he was found dead in the Colony home of friends. A heart attack was the official cause of death. Turner's stockholders were left to retrieve what they could of their uninvested capital. Henry Gutman, president of the "Malibu Improvement Association," revived Turner's plan and enlarged upon it in 1966. 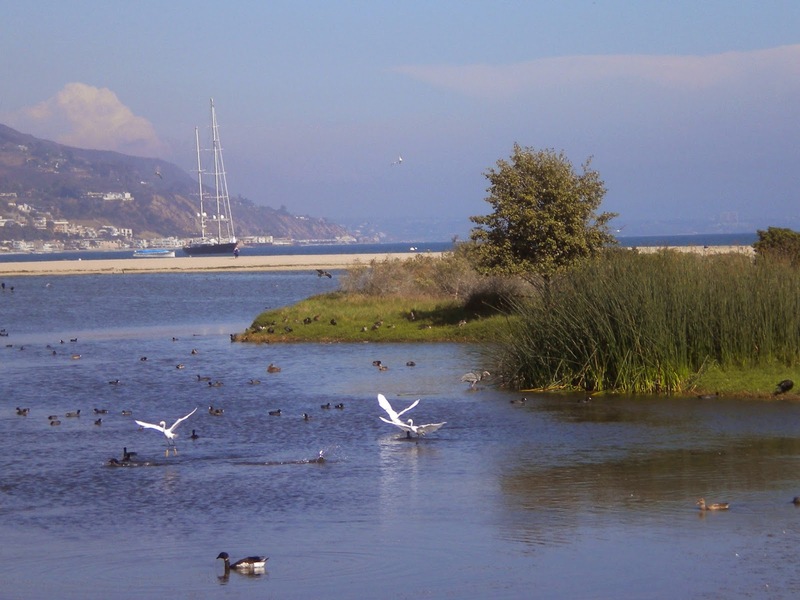 Gutman, capitalizing on a concurrent plan to fill in Malibu Canyon and build a multi-lane freeway from the San Fernando Valley to the sea, planned a full-scale marina. 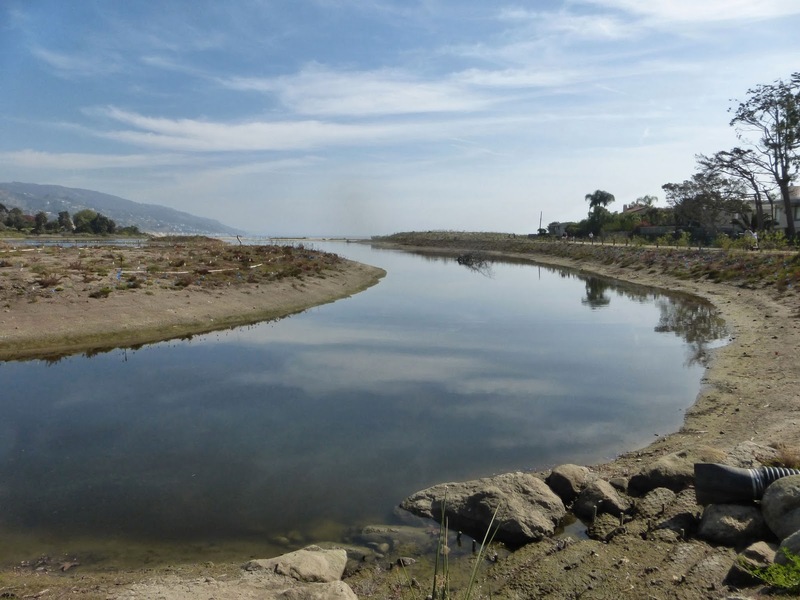 "The county has approved the idea of private financing for the harbor and the Federal Government has expressed interest in the project since being assured space within it for Coast Guard facilities," the 1966 Malibu Chamber of Commerce Guide enthused. "All that remains is the lease negotiations with the state, bilateral approval for the over-all project, and completion of the various stages of development leading up to the marina planned by the Improvement Corporation and the state." The Chamber forgot that Mr Gutman also needed to convince Malibu's residents and self-appointed guardians that it was a good idea. He failed dismally. The fight over the marina and the proposed freeway that would have run an interstate through the middle of what is now the Malibu Civic Center and Legacy Park where two key parts of the chain of events that led to Malibu incorporation. It's clear in hindsight that the none of the proponents of the freeway, marina, causeway, or nuclear power plant ever bothered to look around and see what else was being planned. In the 1960s, the Los Angeles County Regional Planning Commission confidently estimated the population of Malibu would swell to almost 120,000 by 1980. 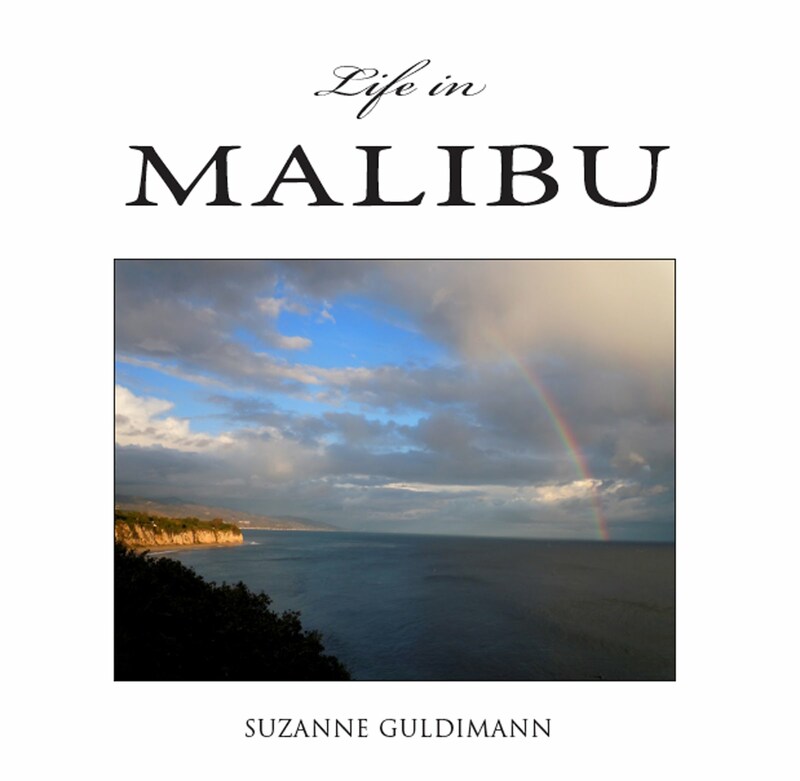 In comparison, in 2010 Malibu had a population of 12,645. The planners and developers of the era envisioned a very different future from the one most people who actually lived in Malibu desired and what the terrain could accommodate without massive human reengineering projects. It's easy to look back and proclaim the abandoned mega-projects of the past as barking mad, but we're still fighting some of the same battles. Some projects just won't die. They rise like tiresome and indestructible movie zombies, bent on devouring brains, no matter how illogical they seem. The City of Malibu has rolled over and given in at last to to the sewers that earlier Malibu activists fought so hard to keep out. The hotel project that was fiercely opposed by the proponents for Malibu cityhood is back again in a new form that is just as unwelcome to the majority of residents as the plan from the 1970s. I wonder what projects the next generation will be shaking their heads over in another 50 years. I hope that Malibu's future guardians will have the courage to stand up against tomorrow's half-baked projects. Maybe we will have learned our lessons by then about coexisting with nature. The problem is, we don't always realize the magnitude of the loss until it is too late. The tree which moves some to tears of joy is in the Eyes of others only a Green thing that stands in the way. Some see Nature all Ridicule and Deformity, and by these I shall not regulate my proportions; and some scarce see Nature at all. But to the Eyes of the Man of Imagination, Nature is Imagination itself. As a man is, So he Sees. As the Eye is formed, such are its Powers.